This is the Third version of LK Magazine Blogger Template Series.I corrected many weaknesses of LK magazine v2 blogger template and add some features from Prozine Blogger Template to this template.To configure this template correctly, read the instruction given below.Like LK Magazine v2 blogger template,I think you will like this blogger template very much.The features of this template as given below. Very pro template...& your blog content is very usefull for new blogger. Really An Amazing Template Bro And Thanks For Making It Look Like Prozine Template And For The Slider..
Can You Say How To? Love this template! But I am having trouble with my drop down menus. In your demo, when you drop down you can reach all the submenu items. In mine, after I get to the second sub item in a list, the menu disappears so those links cannot be accessed. This is what i call a real pro template!! thank you for this great template. looking forward for your next great templates.. I've yet to see a better blogger designer than you. I'd pay hundreds of $$ for this template. Thanks for sharing it for free. nice templates.. I'm very like it.. thanks so much..
thank you for the link to PBT. i found the one that amuze me, "the almoda template" is beautiful! forget to ask you one thing. i'm thinking to use it on my blog so i really appreciated if you can help me out..
Hello Lasantha i'm from Sri Lanka. Hey please help me. i wont make a nice blog and i select this template. but i cant meke "Featured Content Slider" please check my blog and tell me what's the mistake i did. Don't compress above code and then your slider will work fine. Hi Lasantha, Thanks for the new version of LK Magazine Template. Very Nice Template. I Like ur templates very much. 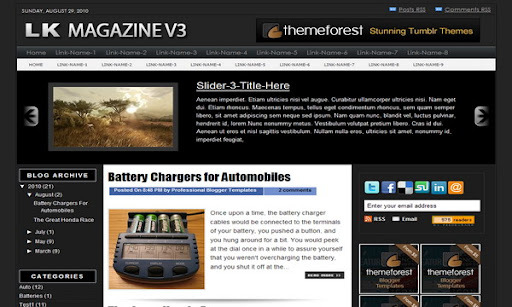 i am using old version of this template for my blog http://igooglemovies.blogspot.com very soon i will update my blog template with this one. i have a problem that ive been researching but cant find easy solution to. i seem to be having a problem with the slider. At first it would scroll and shift content along with its asscioated picture - not it has the right picture but has the description beside it of another column. p.s i absolutely love your templates and your tipsntricks! Loyal fan. Honestly. Your template is great and I am trying it. I have a request, if you can help me. My site is scientific and writing in two languages, and willing to increase the width of the main content column and remove the left sidebar. Please help me, thanks. I admire your work, it's great. 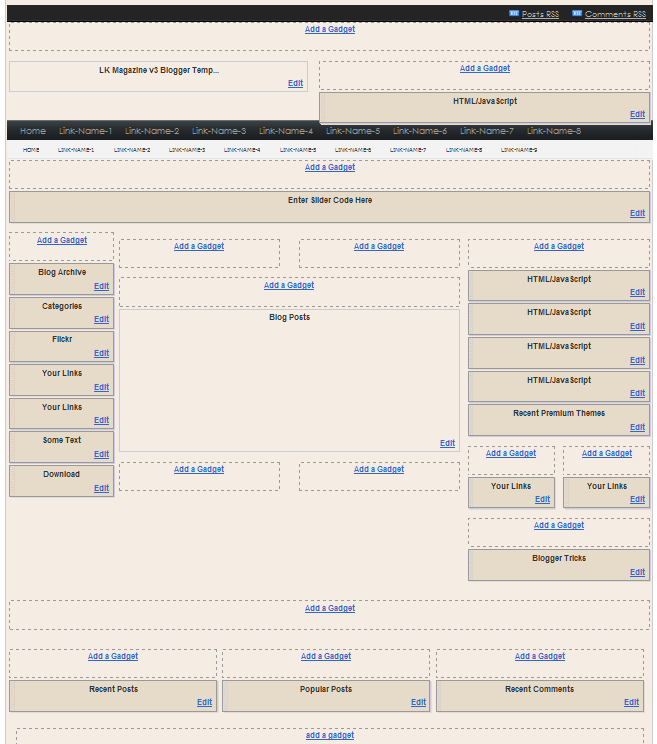 However i have done it correctly with ur previous version of template for my other blog. can u please help me. hello. i need some help configuring the multi tab widget. where do i get the codes for the Recent and Popular posts? How to add Configure Multi Tab view widget?? Content is not allowed in prologue. I put the (HTML)video at"ENTER-TAB-1-CONTENT-HERE" but doesn't work. I Like this templates very much. but I can not add "Vidio" "Recent" & "Popular" Tabs . "ENTER-TAB-1-CONTENT-HERE, ENTER-TAB-2-CONTENT-HERE, ENTER-TAB-3-CONTENT-HERE " how to put content ? can you help me to put the contents ? i've been using this template more than 1 year. this template is awesome! however, i'm having problem recently with this template. all new posts became blank. what should i do? Iam using template LK Magazine V3 and i like it.